I have a deep seated love for coconut macaroons. To the degree that it probably seems a little wacky from the outside. For example, I’m pretty sure that when I look at a coconut macaroon I get that doe-eyed look that an adoring puppy gives to her master or mistress, I love macaroons that much. They’re a sort of edible security blanket for me, and when I eat one I am bathed in a sense of well-being, an internal lightness… Yeah, it definitely seems a little wacky. But, lest you judge, I actually have a quasi-rational reason for feeling this way about macaroons. You see, (and this may be too much information but it’s too late now because I feel the need to explain myself!) I have a wonky digestive disorder that occasionally leaves me doubled over with stabbing pain in my gut. The most frustrating thing about it is the sense that your body is rebelling against you. That you can have seemingly done everything right to care for it and even so the pain will flare up now and then for no apparent reason, leaving you clenching your teeth, fighting back tears, and feeling helpless. It’s the type of thing that leaves you feeling completely out of control. And that is something that we as a species don’t seem to like much. It’s in those moments that we search for talismans or rites, things that we imbue with powers that will allow us to feel we’re in control of the situation, even though we aren’t. You know, rabbit’s feet, lucky socks, throwing salt over your shoulder, those sorts of things. Now, a couple of years ago I heard from a little bird that they had read on the internet that coconut can help with digestive issues. Disclaimer: the internet is not a trustworthy source about these types of things and you can’t just believe medical advice that you read there. However, in a moment of feeling desperate, I decided to try it. On my next bad day, I bought and ate a coconut macaroon, and lo and behold within about a half hour it felt as though my intestines suddenly got over their red-faced angry tantrum and simply relaxed. They unwound. Some of it may have been the coconut. Some of it was probably a placebo effect. I didn’t particularly care. The placebo effect can give you real results, so if you can use it to your advantage, why not?! 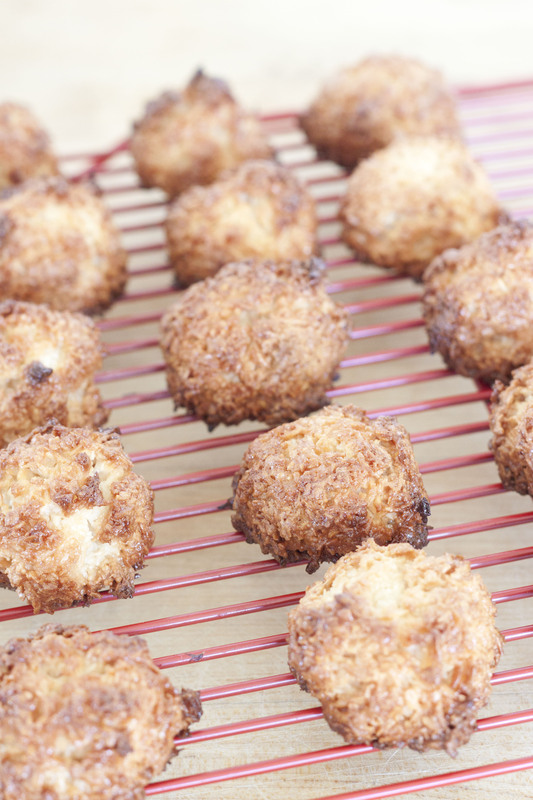 Anyhow, coconut macaroons became my emergency parachute, and I fell in love with them. 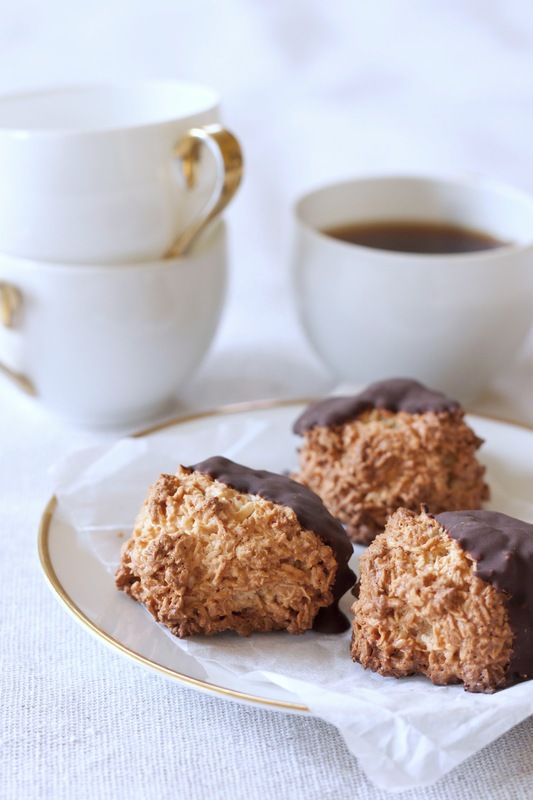 They’re easy little treats to fall in love with, whether or not they make you feel better, what with their crunchy exterior and velvety interior and the powerful flavor of coconut lacing every bite. I also realized after about the 3rd time I ate one that they tasted remarkably like Gjende Kjeks, these delicate, crispy-soft cookies imprinted with a reindeer that we used to eat in Norway when I was little. A little dose of nostalgia never fails to add to the psychologically therapeutic properties of a food. The problem with talismans, and the the danger I began to run into with my macaroon eating, is that their siren song of security can lure you into a false belief that you actually do have control over things. We can start to think that as long as we keep our fists clenched tightly enough around our charms, we can stay in control. But, we can’t. Some things simply are not up to us. The fact of the matter is, there are things we can control and things we can’t, and heaven knows I haven’t yet developed the wisdom to reliably discern between the two. It’s a work in progress. But, I actually think our little symbols and talismans can be of help to us, if we remember what they’re actually doing, which is helping us relax into a situation and to deal with it as it comes at us. It took a shift in focus, but eventually, instead of thinking of coconut macaroons as having a magical property that would fix me, I started being able to view them as something that would help me let go of the need to be fixed. Having my coconut macaroons there, behind that glass that says “in case of an emergency, break glass and use…”, helped me to not panic each time I had a flare up. And then, as I learned not to panic, the pain itself lessened both in intensity and frequency. But, enough of this philosophizing, right!? Let’s talk about the macaroons themselves. There are some bad macaroons out there in this world that give a bad name to all macaroons. Tooth-achingly sweet, heavy, and about the same consistency inside as a pot of partially dried thick glue paste. Watch out for those macaroons, they’re trouble! 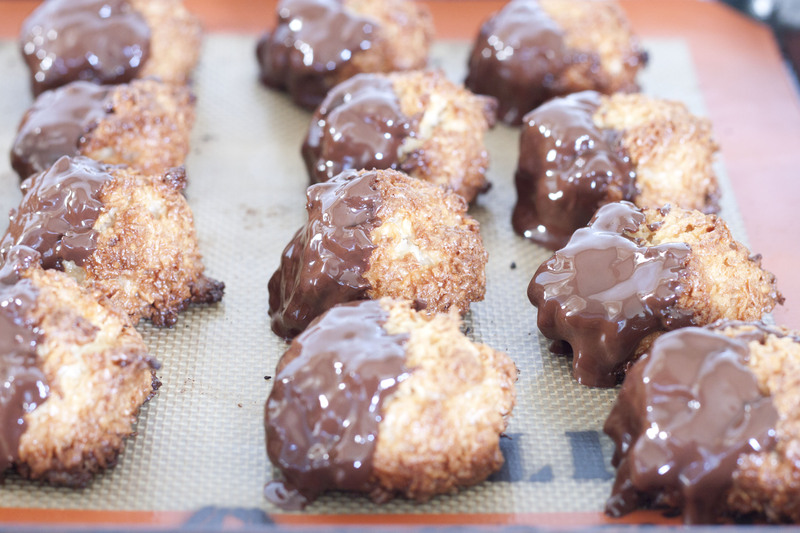 On the other hand, a good coconut macaroon is basically the opposite, an ethereal dream of coconut. The outside should be lightly brown and crackle under your teeth with the thin brittleness of an eggshell. Then, it should give way to a meltingly soft interior. The best macaroons manage to strike a seemingly impossible balance of being both densely creamy and light and airy on the inside, chewy threads of coconut suspended with egg whites. 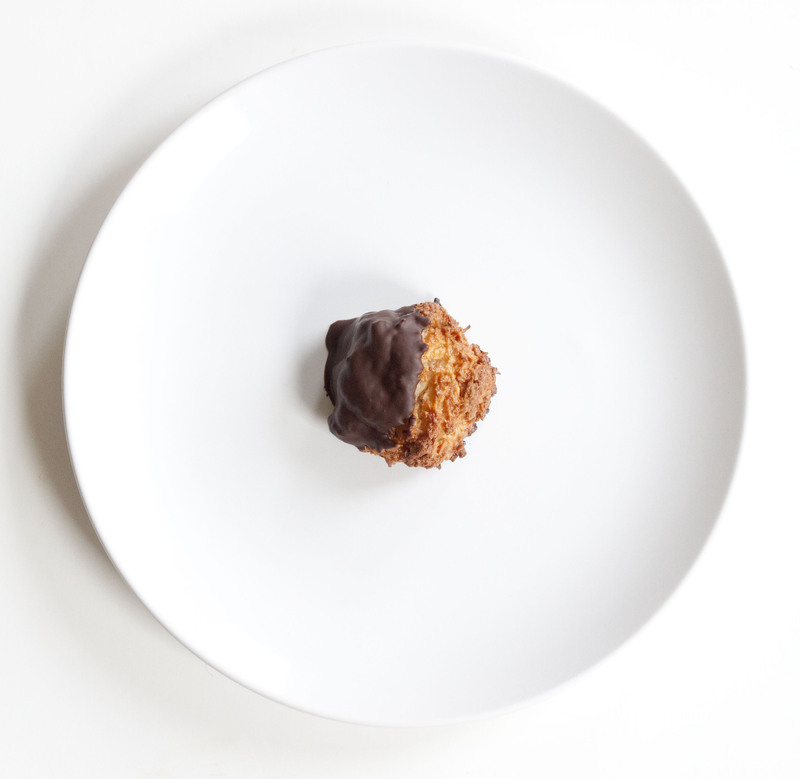 We’re lucky enough to live near a couple of bakeries that produce truly remarkable coconut macaroons. Mind bogglingly good, actually. It sort of makes me wonder why I bothered with making my own. Except that, I had a number of egg whites around from some other cooking escapades and I absolutely refuse to eat egg white omelets. And, for those who don’t live near a bakery that produces dependable macaroons, baking your own is the best way to ensure you get a good batch. I did it for you, you see! So, I decided to explore macaroon recipes. I read a lot of recipes, but I just wasn’t convinced by most of them. Call it a gut reaction. Until I found David Lebovitz‘s. Now, when it comes to things sugar, he is a man you can trust implicitly. Plus, his technique for producing a good texture in macaroons was different and intriguing. He has you take your coconut, egg, sugar mix, and cook it on the stove top for a while until it nearly becomes a scorched mess. Then you whisk it off the heat and let it cool before shaping it and baking it. Now, I don’t know from a scientific standpoint what this actually does to the macaroons, but I can vouch for the result. They are lovely. A perfect balance of sweetness and tropical coconut and just the right amount of chewiness. You can leave them unadorned or dunk them in melted dark chocolate to give them a smooth, bittersweet shell. Either way, they won’t disappoint. And, they keep marvelously in the freezer for up to a couple of months. So you can have a little stash around, you know, in case of emergency. In a large frying pan, stir together the egg whites, sugar, honey, salt, coconut, and flour. Start to heat the pan over moderately low heat, stirring the coconut mixture all the while. Make sure to constantly scrape everything up from the bottom of the pan as you stir. When the mixture just begins to sort of scorch on the bottom, transfer it to a heat proof bowl, stir in the vanilla, and let it cool to room temperature. Preheat your oven to 350F. Line a baking sheet with parchment or a silicone mat. Scoop the coconut dough into 1 1/2 inch little mounds on the baking sheet. Use your fingers to shape them into domes. Bake them for about 18 minutes, until they are golden brown (I let mine get just a tad too brown, in my opinion, but some people like them on the slightly toastier side while some people like them less dark. Personal preference!). Transfer them to a cooling rack and allow them to cool completely. Once they are cool you can dip them with chocolate, if you wish. Just melt your chocolate over a double boiler or in the microwave until melted and smooth. Dip the edge or bootom of each macaroon in, then put the macaroon on a sheet of wax paper to cool. Once finished the cookies will keep for several days in the fridge and several months in the freezer. You are currently reading Coconut macaroons at Five And Spice.